Description: Mates Rates Real Estate is delighted to be marketing this spacious, 3 bedroom, 2 living space home with a big yard at 10/23 Heidelberg Street, Conder. Inside is beautifully presented; with fresh paint throughout. It features a large L-shaped living space, with a Southern aspect that catches the sunshine throughout the day. There is plenty of space for a large lounge and as bonus there is a second living space in the kitchen area, with a Northern aspect. The front of the house includes a spacious, shaded grass area and easy care garden, with plenty of access space to the entryway. The kitchen is bright and sunny, has been updated, features a dishwasher, a gas cooktop and has plenty of cupboard storage with a large inbuilt fridge space. Accommodation includes 3 generous bedrooms; the main bedroom includes a double wardrobe and bathroom entry. The 2-way bathroom has been updated, is sparkling clean and has a full sized bathtub. Hot water is provided by a gas hot-water system. Heating and cooling is a reverse-cycle air-conditioner and a wall mounted gas heater. The house also includes a security alarm system. What you will really love is the outdoor space. Unlike many townhouses, the backyard is large and secure, making it ideal for kids to play. It features a paved entertainment area, easy care gardens, freshly laid turf with inbuilt sprinklers, garden beds and a garden shed. There is also plenty of potential for you to add a vegetable garden, trampoline and have room for pets. There are large trees that provide shade over the back yard during the hotter summer months and it is completely secured with colorbond fencing that includes a rear access gate. Car accommodation is a single lock up garage with internal access into a very generous sized laundry room, as well as inbuilt shelving and workshop space. 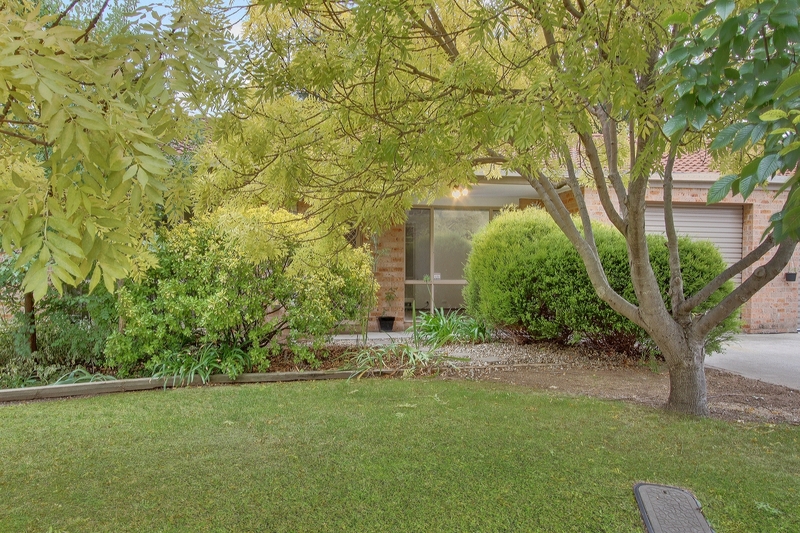 Heidelberg Street is located in a convenient area with easy access to local schools, parks and is within a 5 minute walk to the Lanyon Shopping Centre. Body Corporate fees include regular garden maintenance. Make sure you put this unique home on your list to inspect! - Strata $474 P/Q, Rates $390 P/Q approx. - EER: 3.0, Living size 121.5 M2 inc garage approx. Contact Mates Rates Real Estate Australia Today!!! Email Mates Rates Real Estate Australia Now!